The Olivet Discourse, described in Matthew 24, Mark 13 and Luke 21 is an apocalyptic text based on Jesus discussion with the disciples on the Mount of Olives and it describes events from the destruction of the Temple until the completion of a tribulation period and arrival of the end of time. Jesus gives a warning to his disciples that their followers would suffer persecution and a period of tribulation until the arrival of the Kingdom of God on this earth, that is, the spreading of the Church and Gospel to all nations. John does not appear to include this in his book but the answer is quite obvious why… because John is the author of the much larger apocalypse or Book of Revelation, which is a much more expanded view of events described in the Olivet Discourse. In fact, it can be demonstrated that the Olivet Discourse follows the same sequence and pattern of events described in Revelation chapters 7 to 19, at times using more or less symbolic language than Revelation. Taken in that proper context, and viewing the events described historically, we can come to a better understanding of the true meaning of the discourse. Now let’s examine the text of the Olivet Discourse. For ease of comparison of the texts, I have combined all related verses from each chapter and Gospel together to help the reader quickly see the similarities and differences in the authors’ testimony for each specific event described in the discourse. As Jesus and the disciples were walking away from the temple, the buildings and temple view from across the hill must have looked spectacular to the disciples. They must have never seen anything like it before anywhere else in their travels around Israel. It would only seem natural to admire such a sight and call the attention of their Rabbi to it to also acknowledge the wonderful spectacle. Jesus responds back that all they see and admire is an abomination to God who would soon bring destruction upon the temple the buildings around it. They were probably shocked by that response. How could such a wonderful structure of glorious stone which was a place of worship to the one true God be an abomination to Him, doomed to destruction? 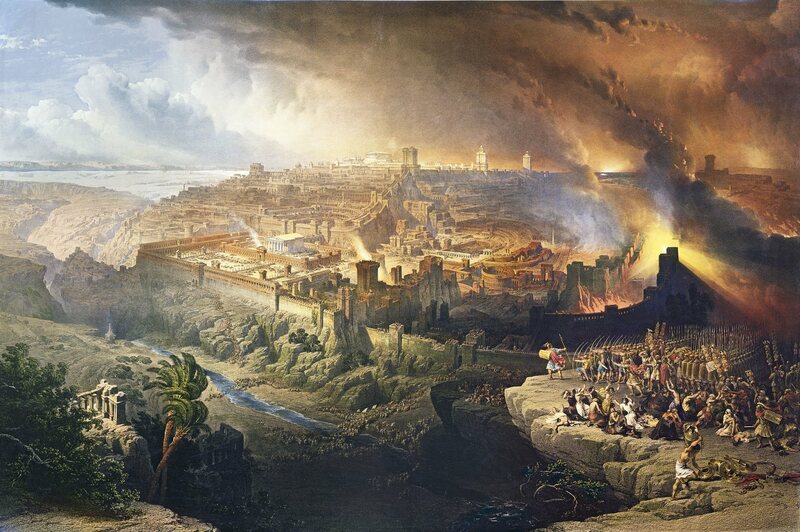 The destruction of the temple would mean the destruction of the Hebrew religion. Where would they be able to go and worship God? The disciples, upon hearing the news that the temple would be destroyed were wondering how this would impact the kingdom of God on the earth, and when these events would come to be. So as Jesus sat down on the Mount of Olives watching the temple and city from afar, the confused disciples came to him privately to seek more details about the timings and clues to try to better understand how and when the temple would be destroyed? And what would be the signs to the end of the age and the coming of His kingdom? Before Christ would provide any details on the specifics of the temple destruction at the appointed time, he provides some specifics on other events leading up to that point. Prior to his return, many false prophets and pseudo-Christs would come to deceive many. This would occur with the rising of second century Gnosticism, Marcionism and Manichaeism. The church would struggle through the various Christological heresies in the age of the Ecumenical Councils. The church of the middle ages would be deceived by the rise of another monotheistic religion of Islam, who’s prophet proclaimed he was greater than Christ. Another pseudochrist who arose in the 8th century claiming he was the Vicar of the Son of God by enforcing the forged Donation of Constantine is the apparent lamb with two horns – the Papacy. The End “will not come immediately” is in sharp contrast to “soon“, “at hand“, “quickly” and “shortly” referenced elsewhere in scriptures in which the Preterists try to promote for the 70 AD thesis. This verse is very damaging for denying the theory of the Preterists that all prophecy was fulfilled by 70 AD. It says here the “end” does not come immediately. But they look to Revelation and insists all of theses things in all in their entirety would “shortly come to pass” prior to 70 AD. This is especially even more suspect given the fact most evidence by the Church fathers indicate the Apocalypse was written around 96 AD. The Kingdom of Christ will do away with the wars of nations and kingdoms with the official establishment of the Church in each nation as only truth and worship of God. But until the fullness of the Kingdom of Christ comes, the wars will continue between the people and kings of the earth. Wars will come and go, many wars, not just a 70 AD temple uprising to complete all prophecy. We are told these wars must take place, but the end of the world is not triggered by the world wars and revolutions. These are not signs of the end of the world, even the coming battle of Armageddon does not signal the end of the world. All these things will happen before the end as prophesied by the holy prophets of God. Therefore, the rumors and worries about the current wars in each generation will carry no fears about concerning the end and the destruction of the present world. Preterists state this occurred with the Jewish revolt in 70 AD. But, Israel at that time was a province in the Roman Empire, not a kingdom. It doesn’t say “province or kingdom against empire.” Historically, the rising of nations and kingdoms against one another began in the year 376 A.D. And this is what many historians call the “Great Migration of Nations” through which the old Roman world of the worldwide power of the City of Rome was destroyed by the 10 barbarian tribes, and upon it’s remains the new nations of Europe were founded. The Huns first marched from Asia into Europe cause the other tribes to migrate and bring about the fall of the Roman Empire. The battles of the nations would continue through the rise of the Ottoman Empire, and world wars of the twentieth century. During this time there are recorded earthquakes, as well as “moral” earthquakes which represent revolutions like the French and Russian Revolution that bring about significant changes in the social order of Europe. There were also two significant plagues that were devastating upon Europe, the Plague of Justinian and the Black Plague, which resulted in up to fifty percent reduction in the populations of Europe and Asia. But these wars and plagues did not wipe out the populations or bring about the end of the days. The key text for the next part of the Olivet Discourse is given to us by Luke in verse twelve – “But before all these things.” This text points is to note the subject content in the previous verses, but first another critical event in the history of the church would occur first. That is, before the false prophet comes, before the rising of the nations and tribes that led to the destruction of the Roman Empire, the Church would suffer a period of great persecution in the early centuries of the Church with the dissemination of the Gospel throughout the Roman Empire and Asia. Those in power and authority were to persecute the disciples of Christ and the preachers of the Gospel, arresting and condemning and imprisoning the Christians who were viewed as a threat to the existing social order, and finally killing them as martyrs in behalf of God’s truth through all of their persecutions, trials and imprisonments. This would be their testimony, left to us through the lives and stories of the saints handed down from generation to generation to encourage and strengthen our faith. These persecutions were not finished by 70 AD, they were just getting started. The persecutions of Nero, Domitian, Trajan, etc, all the way to Diocletian, which was the most severe persecution out of all them, before the “Great Migration” of nations would begin with the Barbarian Invasions on the Roman Empire in the 5th century. By the time these rumored wars and nation/kingdom attacks began the Christian persecutions stopped with the official recognition of Christianity by Constantine. After the completion of witnessing of the Gospel to all nations and the testimony of the woman through the sixth and seventh ecumenical councils, the beast would arise out of the land of Arabia with a new monotheistic religion of Mohammed. The last and third woe or “end will come” after a period of 1260 years of persecution. Throughout this 1260-year period, the preaching of the Gospel was stopped through the spread of Islam in the East and the Papacy in the West. But a time is coming when the True Church will cast away it’s oppression and preach the true Gospel of Christ in the world as a testimony of all nations. When this divine work is completed, the end will come. So we know by observing the signs today that we are still far away from the end of time, because the church is still suffering persecution and the Gospel is not preached to all nations. The key text is: “whoever reads, let him understand” is the only time that the author of the Gospel interrupts their story telling to speak directly to you, the reader, very similar to the commercial interruption on the television or radio. The storyteller becomes an objective third person bystander trying to call your attention to the meaning of the text. Why is this mysterious call to the words brought to light here? Because many Christians have never quite understood the true meaning of the abomination of desolation. The abomination is bright and visible when they look at the Western Wall or gaze upon the city from the Mount of Olives today… but they fail to recognize it. Christians today either believe the abomination already occurred, like the Preterists believe, or they await the fulfillment of this event to be built on the temple mount in the future, like the Futurists and Dispensationalists believe. Idol worship or idolatry is often called an abomination in the Scriptures. The idol is a symbol of worshiping an image of a false god, and idolatry is the religion or worship of the deity. Currently today, there is worship of a false moon God that derives it’s power from the Red Dragon, who claims that Jesus Christ is not God, and is but a man. Fall of Judah to Egypt in 609 B.C. The desolation in 637 AD is much more spiritually significant than the physical destruction of the temple in 70 AD. The Christians during this time of tribulation were told to flee into the mountains and wilderness, because the Islamic invaders would commonly take the children and wives away. The boys were led away to serve in the Muslim armies, the wives and daughters taken away to the harems. This last period of great tribulation is what is described in the prophecies of Daniel and Revelation as the 1260 year period and reign of the Antichrist. During this period, many Christians were persecuted and killed, or converted away to Islam. After the abomination of desolation was set up in 688 AD on the temple mount in Jerusalem, Christ turns our attention to the next period in Church history in the middle ages. The two beasts of Revelation 13 would be the Islamic Beast who rose from the deserts of Arabia, and the Papal Beast which rose from within walls of the church and inner sanctuary of Rome. During this time the Papacy would rule from the Holy Roman Empire from the West, while the Islamic Caliphs and Ottoman Empire would rule from the East. During this time, the True Church would be persecuted and forced to flee from the cities into the monastic wilderness and mountains to survive and maintain the purity of the Christian faith. This 1260 year period would extend through the Protestant Reformation and Age of Enlightenment and into the beginning the Industrial Revolution and political revolutions of Europe. The Futurist interpreters of prophecy often take these celestial symbols to be literal astronomical events and forecast an ominous time of future tribulation upon the earth. Case in point is the “Blood Moon” fever that has circled the prophecy pundits through various books and DVDs. Is there deeper and richer theological significance to these verses? Yes, taken in the proper context, these celestial bodies alternatively may foretell a time of great apostasy, persecution and war within the church. In a previous article, we examined the religious significance behind these celestial symbols. These verses are describing the time beginning with the Protestant Reformation and Age of Reason up to the present time in history where the understanding of the true nature of Christ and the teachings of Scripture and the Creeds of the Ecumenical Councils will become obscured and darkened. During this time the Church will also become red through the martyrdom of the saints and wars between the Christian saints and the enemies of Christ. The time period of the 50000+ denominations of Christianity would certainly be a sign for us to know we are near the “time of the end” when the sun is darkened, the church does not reflect the light of Christ… all of this coinciding with the completion of the “Times of the Gentiles”. Jesus tells us to look at the fig tree to determine that the Kingdom of Christ will be fully established on all 4 corners of the earth. And of course. this leads back to Daniel Chapter 4 and the “Tree Prophecy” in describing the punishment and restoration of the Jews for “Seven Times” or for 7 x 360 years. When the twigs and leaves shoot forth from the regenerated tree trunk, then we know the time is coming marked by a significant event that many Christian commentators and preachers foresaw in the centuries leading up to 1948. St. Paul also speaks about this future integration of the Jews back into Christianity, not as a regeneration from the tree trunk and roots, but through the grafting back in the tree, which is a similar process of enabling tender shoots to grow into big branches and offshoots from the base of a deciduous tree to once again bear fruit. As stated previously, there is a strong correlation with the “Fig Tree” and “Olive Tree” analogy to the “Tree Prophecy” given in Daniel Chapter 4, which is in reference to the Jewish Seven Times punishment and restoration. Through a process called regeneration in nature in which a tree can grow new shoots from the stump at a later period of time. A command is given to leave the tree stump and roots, so that the cut down tree would at a future appointed time have the ability to sprout new branches and eventually be restored to a full tree, if the conditions were favorable for regrowth (i.e. true repentance). In decoding the passages, Nebuchadnezzar’s dream describes the 2520 year punishment of Leviticus 26, where the Jews would be placed among the Gentile nations, as historically has been witnessed until their return in 1948. And the fulfillment of the dream occurs when his “sanity” is restored and he praises the most high with a prayer similar to “Blessed is he that comes in the name of the Lord.”. There is no solid historical evidence that Nebuchadnezzar left his throne for 7 years and went crazy in the wilderness. Daniel chapter 4 is a symbolic prophecy because he represented the ruler over the Jews at the time. And some have suggested the dating for this prophecy was between 573 BC to 568 BC. Incidentally, 572 BC + 2520 years = 1948. That is, “Seven Times” after the prophecy was written, the Jews returned. In further analysis, the “Fig Tree” represents the Church. Some branches were cut off from the tree over time due to their disobedience. When the spiritually dead and divided Church of today shows the first signs of regeneration, resurrection and restoration, then the spread of the Gospel over the entire earth is accomplished, so that the word of Christ may be fulfilled “and that this gospel of the kingdom may be preached in all the world for a witness to all nations“… then and only then… the END WILL COME. In other words, the Mystery of the Jews will be completed when they proclaim Jesus as the Messiah at the Seventh Trumpet. They are to be fully restored after their Seven Times exile and like Nebuchadnezzar will praise and exalt the name of Jesus as he proclaimed in Matthew 23:39. Heaven and earth shall pass away, empires will rise and fall, the “Kingdom of God” (i.e. the Church) will fall into heresy, division and destruction when the ethical and metaphysical Sun will go dark, and the church will not reflect and shine the true light and doctrines of Christ, and the bishops will fall from heaven in disgrace. But only after these things are witnessed after the 1260 year tribulation period, will the end finally come. And the words promised here of Christ shall not pass away before these things are all fulfilled. Sadly, the Preterists take the term “this generation” from scripture and base a whole doctrine and belief system and try to promote to everyone that all is fulfilled with the temple destruction and fall in 70 A.D., but they still fail to see the greater human drama and fight between Christ and Satan through the biblical prophecies. This is the sworn statement, signature and seal that Christ puts on the prophecies of Matthew 24, Mark 13 and Luke 21. There might come a time when the current physical heaven and earth shall pass away and cease to exist. But there is no time at which the words of the Lord prophesied in the Old Testament will remain unfulfilled about the Jews returning to Israel and their acceptance of the rejected Messiah. For every word and prophecy will be accurately fulfilled at its proper appointed time. This promise was established and foretold and will be executed and fulfilled through the God-appointed “times” measurement using the cycles of the Earth and Moon around the Sun… the “times” foretold and established since the dawn of creation.